The International Cryptographic Module Conference is the leading annual event for global expertise in commercial cryptography. 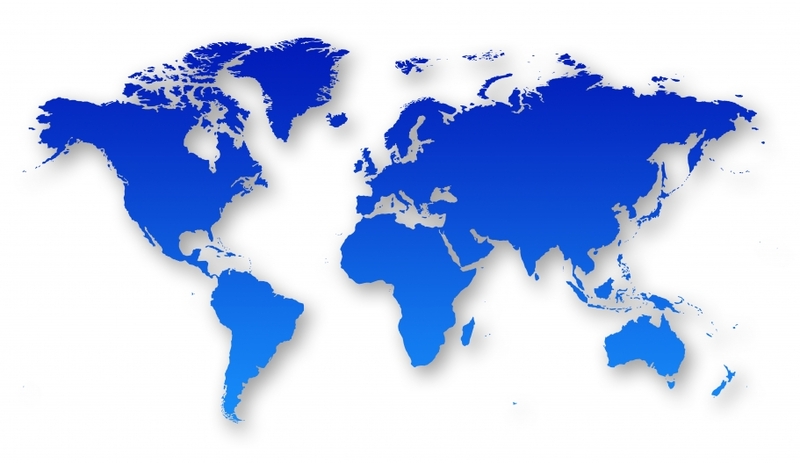 At the seventh annual edition of the conference on May 14-17 in Vancouver, Canada, 400+ industry leaders from over 25 countries will convene to address the unique challenges faced by those who develop, produce, test, specify, and use cryptographic modules, with a strong focus on standards such as FIPS 140-2, ISO/IEC 19790, and Common Criteria. The conference helps to foster a focused, organized community of users. ICMC reviews technical issues underlying cryptographic implementation including physical security, key management, side-channel analysis, open-source development, algorithm testing, quantum threats, embedded applications, standardization, validation programs, government policy, professional ethics, and more. 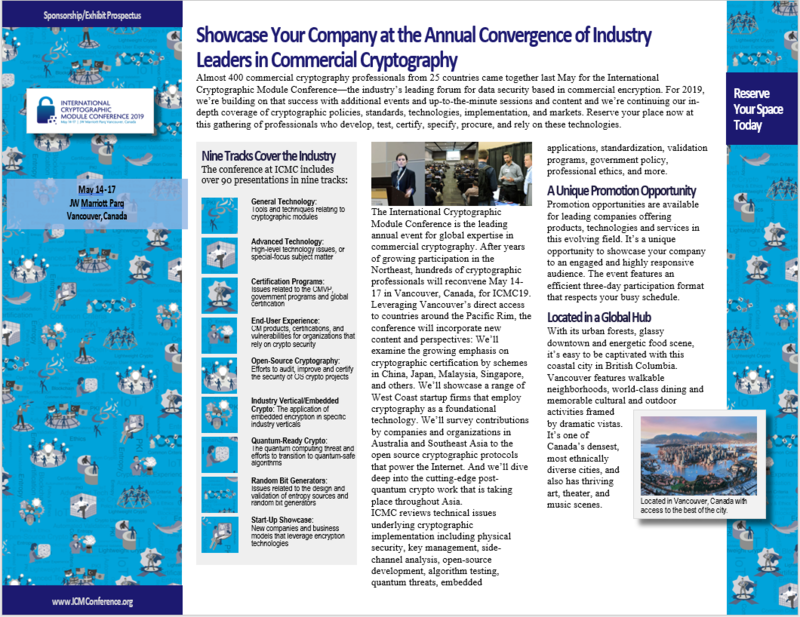 Who Attends: ICMC brings together professionals involved with data security based in commercial encryption, especially those who develop, manufacture, test, specify or use certified commercial off the shelf hardware, software, and hybrid cryptographic modules. Key participants include laboratories and government departments responsible for testing cryptographic modules; stakeholders in standards development; leading members of the academic community; embedded systems OEMs; and the side channel research community. Participating federal agencies include CSEC, NIST, NIAP, NSA, DoD, GSA, and others. The Cryptographic Module User Forum (CMUF) provides a voice and communications channel between the community of unclassified cryptographic module (CM) and unclassified cryptographic algorithm developers, vendors, test labs and other interested parties, and the various national, international, and multi-lateral organizational committees, schemes, and policy makers. Click here to see the complete list of ICMC18 registrants. Establish your presence at ICMC. Your booth puts you in front of attendees, so they know where to find you and can make contact. Includes: Exhibit booth space with 5’ x 30” high table, chair, and company ID sign. ● One complimentary conference pass ● Admission to all conference activities ● Inclusion on email, web and collateral—over 800,000 impressions. Title Sponsorships put your branding message front and center, next to the title of the conference. Title sponsors receive exclusive branding opportunities prior to, and during the event. Title sponsors may choose from premium sponsor booths, located at the front of the hall. Leading sponsorship opportunities are a great way to make a targeted, unique, or personal marketing impression on conference participants. Supporting sponsorships help to reinforce your branding and presence at the event. Banner (sponsor provides, up to 8’ x 8’) to be hung in conference registration area. All conference attendees receive an official welcome packet of conference materials. Includes: One insert into handout materials placed in conference bags. The conference program guide is distributed to all attendees and it kept as an information resource long after the conference is over. Reserve your ad space by the insertion deadline: April 16, 2018. One Page BW Ad: $1400. Art Deadline: April 17, 2018 Mechanical Requirements: 1 Page Ad Trim Size: 7 ½” x 9 ¾ “, Live Area: 6 ¾ ” x 9”; Half Page Ad, 7 ½” x 4 ¾ ”; Quarter Page Ad, 3 ¾ ” x 4 ¾ ” File Format: High-resolution PDF file required. Almost any high-resolution PDF file acceptable. Files in Adobe’s PDF format created from an Adobe application using the PDF/X-1a:2001 specification preferred. Typically, PDF files are created from Postscript files utilizing Adobe Acrobat Distiller, but PDF’s created from InDesign will work as well. Line Screen, Binding: 133 for 4/c ads, 280% maximum density, 120 for B&W and 2/c ads, 180% maximum density. Saddlestitch. File Submission Instructions: Email preferred. Send to [email protected] Files received will be confirmed. To mail, send memory device to Cnxtd Event Media Services, 421 Seventh Ave. #1012, New York, NY 10001. To FTP: We recommend Hightail, a free online FTP service. Visit www.hightail.com for instructions. For assistance call 212-866-2169.